Every year, as summer turns to fall, the other technicians and I are given a moment to catch our breath. The ants – which represent about 65% of our emergency calls each year generally stop trying to invade Southern California homes by late October. Right around Thanksgiving, though, the winter pests come knocking – rats, mice, spiders. They want in. Here are some tips to keep them out. Cover your trash cans. And keep them away from your home. Trash cans attract rats, mice, and larger pests like raccoons and opossums. Ants and roaches are also big fans of your trash – don’t let their parade take a detour into your living space. Move wood piles. Move any wood piles (or clutter piles) away from your home. 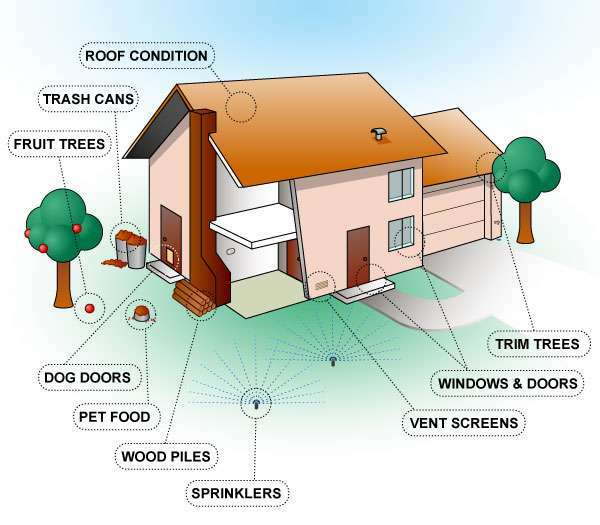 Pests very much appreciate piles of stuff, and wood piles provide perfect shelter for rodents, black widows – and especially termites. Adjust sprinklers. Switch from your summer watering schedule. Too much water in the yard makes attracts spiders, slugs, snails and other pests. Remove fallen fruit. I always recommend to my customers that they pick up all fruit that has fallen to the ground to prevent rats, mice and other pests from being attracted to the scent of decaying fruit. Trim overhanging branches. Tree branches that hang over your roof create a superhighway for pests – especially roof rats, which love the quiet shelter of attics. Maintain your roof. Broken tiles, missing shingles, and roofing soft spots provide opportunities for pests to get in. While you’re up there, check your chimney, too – and make sure that the flue is clear before the first use of season. Weather-strip your doors. If you can see light beneath your front door, rodents can probably squeeze right through (this also applies to garage doors!). Weather-stripping is cheap and easy to attach. This is also a good time of year to make sure that your windows are properly sealed, too. This keeps out cold – and roaches and earwigs and spiders! Repair vent screens. In my experience, about 50% of all interior rodent problems start with damaged or missing vent screens (to crawl spaces, garages, and attics). It’s much cheaper to replace vent screens than it is to chase rodents! Make sure your dog door shuts properly. The good ones often use magnets to seal themselves shut. A loose dog door puts out the welcome mat for rodents – and opossums, skunks, and raccoons. It will take very little effort to keep this winter’s pests out of your home. Minimizing the things that attract bugs to your yard – and sealing the entry points to your living space – will make for a much more pleasant holiday season, and guarantee you many a silent night. If pests do somehow breach your perimeter, though, don’t hesitate to give me a call. Happy holidays.